Over the past 25 years, the Taiwan Industry Image Enhancement Project (IEP) has not only kick-started Taiwanese manufacturing innovation, but also helped Taiwanese brands to showcase their values around the world and witness the transformation of Taiwanese industries into global ones. The 2017 Taiwan Excellence Award, evaluated based on R&D, design, quality, marketing, and made in Taiwan (MIT) aspects, awarded 518 companies and 1,188 products from different industries. Candidates grew by 4% compare with previous year and nearly 70% are small and medium enterprises. DA.AI’s Eco LOHAS Series has received the great honor of the 2017 Taiwan Excellence Award due to its eco DNA and humanitarian values. Two year ago, the series also stood out from over 40 products in the social category and won the 2015 Cradle to Cradle Innovative Design competition. 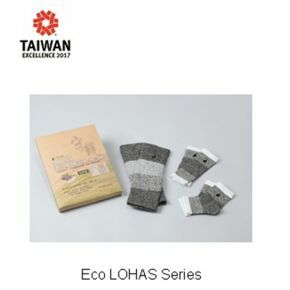 The Eco LOHAS Series follows “zero waste concept, renewable energy and carbon management, and creative innovation” principles, the manufacturing process is as eco-friendly as the product itself. The Eco LOHAS Series, including a pair of elbow, knee, and ankle protection each, are made with a combination of DA.AI yarn, Lycra elastic yarn, and far infrared yarn for strong support, flexibility, and warmth. DA.AI designer, Margaret Liao, expressed her design inspiration came from seeing environmental bodhisattvas often struggle from old knee injuries, and wanting to protect them from pain when they are protecting our planet. The series shows eco-fashion, living, creativity concept, as well as how DA.AI merges environmental protection technology with love.